What better way to start Autumn than with a gift of sunshine? Petrel14 of Dearkitty1 blog has nominated me for the Sunshine Award. I am very thankful for this nomination. This is my third nomination and I humbly accept because it gives me another opportunity to pay it forward. Thanks to followers and those who have been my inspiration and encouragement. Thanks to Studiotj and Barclay Dave for their nominations. Thanks to my dear friends for this humbling honor. I also want to take this opportunity to thank followers, visitors, and participants. We Hold These Truths To Be Self-Evident has been nominated for Versatile Blogger previously, so I’m not repeating the Rules here, which are similar to the Blue Sky Tag. What better way to start the year than to offer a gift of good cheer? StudioTJ/Roach59, has nominated blackbutterfly7/We Hold These Truth To Be Self Evident, for the Sunshine Award. Roach has a very inspirational blog and also posts some current news and human interest stories. This is our second nomination for the Sunshine Award, and I humbly accept it because it gives me the chance to pay it forward again. We Hold These Truths To Be Self-Evident has been nominated for two awards. Because some of the rules are the same, I’m combining this acceptance. First, I want to apologize for the delay in accepting these awards. Our Word Press community is awesome, and I want to thank all of our subscribed followers and participants. Here’s a special shout-out to Roach59 for nominating us for the Sunshine Award. Thank you, my dear friend Roach59. It’s with much appreciation that I accept this award. We Hold These Truths To Be Self-Evident/Blackbutterfly7, has been nominated for the Blogger Recognition Award by two different bloggers. Each one has different rules. One does not require nominating 15 other blogs, and the other does, so I’m going more than half-way and nominating eight. The “Respect Award” is a personal award, made by Robert Goldstein for fellow bloggers who consistently reach out to other bloggers, offer support, are kind, struggle to understand differences in people, and who treat themselves and other people with kindness and respect. We Hold These Truths to Be Self Evident/Blackbutterfly7, has received the Respect Award from Horty of It is What it Is. Thank you, my dear friend. I am honored. This award is very special. You can choose to copy the Award Picture and give the award to the people who have earned your respect or you can do nothing. This is a way of saying thank you. I am truly honored to receive this award and it gives me joy to pay it forward. “Blogging, some say, is losing ground on the Internet. Many people are now using Twitter or Snapchat or Instagram to convey their thoughts, leaving the more ‘old-fashioned’ blog behind. Blackbutterfly7 has been nominated by Micheline Walker for the Creative Blogger award. Micheline posts on arts, music, history and current events. She does fantastic research. Her blog is a work of art. No wonder she has over 1,400 followers. To be nominated for this award by Micheline is a true honor. Caring for others is a must for this Award. Together let us Beat our Drums for Harmony, Peace, Unity, and Equality. Let the Beat of your Thoughts Ripple out as we share our Hearts in One Beat of Unity. Barbara of Idealisticrebel has nominated Blackbutterfly7 for the Premio Dardos Award. I am humbled and appreciative for this nomination because Blackbutterfly7 was nominated by a blogger who runs a very incredible blog. As a “prize dart” it means that I get to “hit” 15 other blogs with recognition. In accepting this award, I would like to thank Barbara, our followers, visitors, and participants. There was a time when I visited bloggers who came by for the first time and said “Hi” by clicking like, and also went to blogs of new followers to thank them. Time does not provide for me to visit each individual blog now, so please receive my collective, appreciative “Thank You”. So this is for all who click away on the computer with a heart full of love, kindness, compassion and caring. For all of you who write to correct wrongs and injustices. For all of you who work to bring light into our world and hope to people’s lives. You are all heroes in my book. Please accept this heart-felt award and pass it on to those in your WordPress family who deserve it. Let’s keep it going for the entire year. May it inspire all with light, words, and love for the human family. The beautiful and talented Just Patty has nominated Blackbutterfly7 for the Community of Bloggers Award. This is truly an honor. The community of bloggers that I’ve come to know this past year are diverse, talented, and informative. There are times that I feel guilty not timely keeping up with them all, including not visiting the blogs of new subscribers and new visitors to thank them. I hope that they accept my apology and this group acknowledgement of thanks. Kev has nominated Blackbutterfly7 for the “Bloggers Who Care, Community Heart Award.” Horty also nominated Blackbutterfly7 for the same. I thank both of them. It’s an honor. I love you too, Kev. Blackbutterfly7 has been awarded the “Wonderful Team Member Readership Award” by our friend Coach Muller of Good Time Stories. (Addition:) As I was going through other award nominations, I found where our dear friend Horty also nominated Blackbutterfly7 for this award. Here’s thanking her as well. Coach Muller blogs stories that make my heart smile, and some that cause me to deeply reflect. Thanks for the award, Coach. I am deeply honored and grateful. “Xena loves butterflies. So, who else would be a great recipient of this beautiful creation? She’s a wonderful human being who champions causes that are fought in the legal arena. She works continuously and keeps us informed of events that may otherwise be forgotten. She literally “fights” for the underdog and those affected by miscarriages of justice in spite of the many attacks that she finds herself under. Blackbutterfly7 has been nominated for numerous awards and I have to comply with the rules for acceptance. I would like to acknowledge those who have nominated us for awards, and accept one of them via this post, giving my word that I shall work on complying with the rules so I can honor their thoughtfulness and gracefulness. Horty; Mavadelo; Joe Bradshaw; Coach Muller and Just Patty. 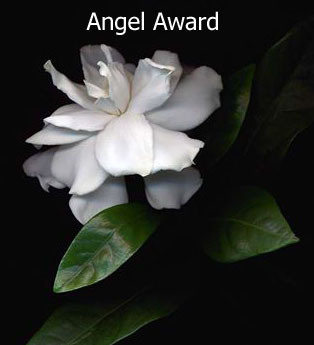 Blackbutterfly7 now humbly accepts the Angel Award. There are various thoughts about angels in theology and myths. Personally, I believe that angels are those who are of the same spirit/motivation, who minister positive messages or positive actions to the lives of others. “Positive” can be defined as whatever is necessary and needed for any individual at any given time that gives or adds to their life, joy, peace. Imagine my surprise when Horty passed the Angel Award to Blackbutterfly7!! It is humbling to be honored by one’s peers. Horty of “It Is What It Is” has nominated Blackbutterfly7 for this award. I am honored and humbly accept. This award comes with a commitment because the rules require that I share three ways that I like to help others. Lighthouses aid in navigation for safety and mark dangerous coastlines for safe entry. The term is also used for organizations dedicated to overcoming vision impairment. Blackbutterfly7 endeavors to shed light so those impaired by prejudices, hatred, and violence know that is not the correct path to life, liberty and happiness.